The International authority for the class racing rules shall be the Laser 28 Executive Council through its Chief Measurer. The English text of the Laser 28 rules shall govern. For the purpose of Laser 28 Class racing, except as specifically permitted in these rules, it is prohibited to remove or make any additions or alterations or make any changes in shape or profile to the hull, keel, rudder, saildrive, deck, spars, construction, equipment, type of equipment, fittings, type of fittings, placing of fittings, standing rigging, and running rigging as originally supplied with the boat. Any attempts to make changes not specifically permitted is a breach of both the spirit and the substance of these rules. To ensure fair class racing. It is the intent of these rules and specifications that the yachts have equal potential speed when they are well prepared and well maintained. These rules intend that no racing advantage be attainable from the absence or addition of features or equipment. Nor from modifications to the hull, keel, rudder, saildrive, deck, spars, construction, equipment, type of equipment, fittings, type of fittings, placing of fittings, standing rigging, and running rigging which makes the yacht deviate from the standard LASER 28 Sailboat. Furthermore, it is the intent of these rules to equalise the potential speed of the participating yachts so that the skill of the skipper and crew in tuning, maintaining, and racing the yacht are the major factors in the outcome of class racing. A Laser 28 shall be built only by builders licensed by the Copyright Holder and shall be constructed and finished according to the original design and building specification of the Copyright Holder. b) A sample of 5 other boats shall be taken and measured using identical techniques. The dimensions of the disputed boat shall be equal to or between the maximum and minimum dimensions obtained from these 5 boats. If the boat in question is outside these dimensions the yacht shall be disqualified and the matter, together with any relevant information, shall be reported to The Council of the Laser 28 International Class Association at its Head Office. A Laser 28 Class Measurer shall report to the L28ICA Executive Council anything which might be considered to be a departure from the strict one design criteria or the intended nature of the class. Measurement of said yacht(s) may be revoked by the L28ICA Executive Council even if the specific requirements of the rules are satisfied. It is the responsibility of the owner to ensure that the yacht complies with current class rules before racing in all Laser 28 one design events. a) Class Sails are: Mainsail, Genoa, Lapper, Working jib, Stormjib, and Spinnaker. - Weight: Min. (258g/sq Meter, 6.0 oz), except for a soft foot shelf not exceeding 330 mm in width. - Max. luff, 10.10 M.
- Max. foot, 3.95 M.
- Max. head width 0.14M. - Max. MGU, 1.52 M.
- Max. MGM, 2.56 M.
- Max. MGL, 3.38 M.
- Reefs: Min. 2 working reefs required, First reef min. height above foot .90m, Second reef min. height above foot 2.1m. - Battens: 4 battens of any length, spaced approximately evenly along the leech. Genoa - Material: Woven Polyester, Mylar Film, Polyester Fibre, Spectra Fibre, Aramid Fibre. All substrate/film laminates shall have a Min. film thickness of 1.5 mils. - Weight: Min. (137g/sq Meter, 3.2oz)for substrate/laminate sails, Min. (200g/sq Meter, 4.67oz)for Woven Polyester sails. - Max. LP: 4.56 M.
- Max. LP: 3.12 M.
- Max. MGU, 1.17 M.
- Max. MGM, 1.99 M.
- Max. MGL, 2.70 M.
- Max. Luff: 8.46 M.
- Max. LP: 2.88 M.
- Battens: 3 battens, Length unregulated. - Weight: Min. (40g/sq Meter, .93oz) Commonly known as a .75oz Spinnaker. - The spinnaker shall be symmetrical in shape and construction about its centerline. - Max. Luff 10.06 M.
- Max. Girth 5.97 M.
Unwoven or X-Ply reinforced transparent materials are permitted. The total area of which shall not exceed one square meter per sail. Cloth weight shall be defined, in the case of woven materials, as the weight of the finished coated woven material used in the sail and, in the case of substrate/film laminate, as the weight of the finished fabric, including substrate, film and adhesive, used in the sail. Minimum cloth weight applies to all parts of the sail, not averaged over the total area. Fabrics allowed specifically are: woven polyester, mylar film, polyester fibre, spectra fibre, & aramid fibre. f) All headsails shall be made and measured in accordance with the current recognized ISAF "Guide to Sail Measurement", found in the rules>technical>measurement section of www.sailing.org. i) A third row of reefing points may be added to the mainsail. ii) Draft indicator lines may be added to any sail. iii) Anti-chafe patches may be placed on any sail. iv) The mainsail may be equipped with a bolt rope or slides. Foresails may be equipped with hanks or luff tape. a) The registration number of each boat shall be moulded into the transom above the waterline. b) The sail number shall be as required by the owner's National Authority. In the event that a National Authority has no sail number requirement the sail number shall be the international number displayed on a plaque inside the cockpit. c) The Class emblem shall be only on one side of the mainsail. d) Identification on sails shall conform to the current Racing Rules of Sailing of the ISAF and the National Sailing Authority's Prescriptions to the said RRS. Laser 28's shall conform to the minimum Class equipment and requirements listed below. Any boat not complying with minimum equipment and/or requirements shall be disqualified. It is the responsibility of each competitor to comply with all Laser 28 Class rules and requirements and any additional rules and requirements set forth in the notice of race and/or sailing instructions. - Proof of Class Membership for each boat / owner. -A maximum of one, and only the same one of each class sail, may be carried and used in a race or series of races, with the exception that two spinnakers may be carried and used. -Anchor, must be 13 lbs minimum weight, plus a 50 ft Rode attached to it and stored in the Anchor Well. -Manual Gusher pump hose 1-1/2” corrugated hose attached to the pump must be able to reach the galley doors. -Complete Dinette Table in original location. -Ice box and Dry food storage covers. -Head basin installed as original equipment. -All sliding panels and doors in place. -All Soft Lockers Installed. There are 9 soft-lockers in total for the later designed boats and 8 soft-lockers for the early designed boats. -All Cushions installed with their integrated wood support panels under the foam (There are 15 cushions in total) The integrated wood support panels must be of marine plywood of minimum 3/8” thickness. -All Plumbing, Seacocks, Thru-hulls, Hoses, Toilet and Holding Tank and fittings installed as originally supplied. -One Battery: Group 24 Minimum Size. -Companionway Wash boards with Minimum Thickness of 9mm. -All Cabin soles installed with Minimum Thickness of 3/8” marine plywood. -Anchor and Steaming Lights installed, Mast Wiring and Conduit installed. a) The crew shall consist of a minimum of 3 persons unless specifically overridden in the race instructions. b) The total combined weight of the crew shall not exceed 499 kg when weighed in normal dry clothing. c) For Class racing, a maximum of one, and only the same one, of each Class sail, may be carried and used in a race or series of races unless permission is granted by the race committee in the event of damaged sails. A series of races is two or more races which count towards an overall points total up to a 10-day period. Exceptions to this rule are: Two spinnakers may be carried and used. d) Attachment or use of a cunningham on any headsail is prohibited. e) Attachment or use of a spinnaker or headsail retrieval line (dousing cord) is prohibited. f) A Laser 28 shall race with the design specified equipment and furnishings on board and stowed in its normal intended place. g) The use of a foresail halyard or mechanically adjustable device to vary the length of the forestay / turnbuckle assembly while sailing is prohibited. h) It is prohibited to have bushed or unbushed holes or slots to feed halyards or control lines through the deck, hull or transom. Any equipment or device to feed halyards or control lines below deck is prohibited. i) It is prohibited to remove any original equipment or fittings except where specifically permitted within these rules. Exceptions to this rule are: The tweaker/twing cleats may be removed. The cockpit sole pad eye may be removed. Single point lift port may be removed. Stern pushpits may be removed from early boats and replaced by a full sternrail with ladder. a) When racing in Laser 28 One Design races, Class racing or Class Sanctioned Regattas each Laser 28 or owner/operator shall be a current member of the International Class Association. b) The intent of this rule is such that an owner who has paid the annual membership for his/her boat may travel and race another Laser 28 and be considered a paid member while his/her boat still maintains it’s paid membership status. 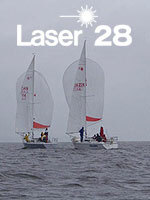 c) Laser 28 one design races include all events and/or races in which Laser 28's are scored separately. Sanctioned Class Regattas are designated Laser 28 one design events that have been selected by the individual fleets to best represent the spirit and camaraderie of Laser 28 one design racing. These Regattas include the following events and any event(s) proposed by the individual fleets that are approved by the Council. Backstay: 4.76 mm (3/16 in.) Exceptions to this rule are: Synthetic cordage may be used. Adjustment shall only be with a (3/8” diameter thread) threaded bottle screw (turnbuckle) or similar. Hydraulic or stored power adjusters are prohibited. b) A Luff Groove device may be fitted to the forestay. c) A topping lift may be fitted to either the mast head crane or the backstay. d) Lifelines shall conform to the current Racing Rules of Sailing (RRS) regulations. Existing lifelines will be grandfathered until they are replaced, then they must conform to the current Racing Rules of Sailing. a) Any sheets, lines or halyards may have their cover stripped or removed so that the effect is a tapered rope. b) The main halyard shall be of synthetic rope not less than 8mm diameter (before the cover is stripped) or synthetic rope and wire combination. A spare main halyard may be fitted. c) The genoa halyards shall be of synthetic rope not less than 8mm diameter (before the cover is stripped) or synthetic rope and wire combination. Both halyards shall be installed and functional. e) One boom vang, or non-hydraulic boom strut may be fitted of synthetic rope, tubing, and/or wire and any combinations of blocks are allowed with the control line terminating on the upper deck area. A self-cleating block may be substituted for the becket blocks supplied. Extra turning blocks, fairleads and cleats may be fitted for the purposes of this rule. f) One spinnaker pole downhaul and topping lift may be fitted and the control lines may be led to any area. Extra turning blocks, fairleads and cleats may be fitted for the purposes of this rule. g) One mainsail outhaul of synthetic rope and/or wire combination with unlimited power ratio is allowed with the Control lines terminating on the upper deck area. The purchase system shall remain inside the boom. Extra turning blocks, fairleads and cleats may be fitted for the purposes of this rule. h) Mainsail cunningham controls of synthetic rope may be fitted which may include a single wire strop for attachment to the mainsail. The power ratio is unlimited with control lines terminating on the upper deck area. Extra turning blocks, fairleads and cleats may be fitted for the purposes of this rule. i) One Backstay adjuster of synthetic rope and/or wire combination with unlimited power ratio. The control lines shall be terminated at the transom or led forward into the cockpit. j) The mainsheet traveller controls may be fitted with unlimited power ratio. Control lines shall be terminated in the cockpit. Extra turning blocks, fairleads and cleats may be fitted for the purposes of this rule. k) The mainsheet system shall be of synthetic rope with a maximum power ratio of 8:1. Control lines shall be terminated in the cockpit. Ratchet blocks are permitted on the mainsheet system. l) Headsail sheets shall be of synthetic rope not less than 8mm diameter. Spinnaker sheets shall be of synthetic rope of any size. The number of spinnaker and headsail sheets is unrestricted. Ratchet blocks are permitted on the spinnaker sheet system. m) Reefing lines of synthetic rope for a maximum of 3 mainsail reefing points may be led to the gooseneck area, the mast base area or the cockpit area. Extra turning blocks, fairleads and cleats may be fitted for the purposes of this rule. n) The Mast may be altered so that the Spinnaker halyard may be jump hoisted at the mast and cleated at the mast. An additional cleat and fairlead may be mounted on the mast for this purpose. a) Winches, cleats, blocks, fittings and shackles may be replaced by those of a similar size and power provided that the replacements are positioned as closely as possible to the original and that the function remains the same as the original. b) Additional cleats may be mounted in the vicinity of the winches. c) Additional jib turning blocks may be added and the number of jib fairlead blocks is unlimited. Additional genoa tracks may be fitted on each side deck at any position between the cabin side and the toe rail. d) Barber hauler systems for the jib and twing lines for the spinnaker sheets are permitted. Additional cars along the side rail for either system are permitted and holes may be drilled in the rails to position cars. Turning blocks may be fitted with snap shackles and may also be attached to stanchion bases. The attachment of twing or barber hauler lines to spinnaker sheets or jib sheets is unrestricted including the use of a fitting that allows the lines to be taken back to the rail or some other attachment point to increase the purchase to a maximum of 2.1. Twing or barber hauler lines may be used as sheets for any headsail. The type and position of the cleats for the barber hauler and twing lines is unrestricted except that the control lines shall be terminated outboard of the companionway and shall not be led across the companionway. e) Deck mounted clutches may be substituted with other types and sizes of stopping devices. This to include cleats/Jammers and constrictors and other types of clutches. A boat shall not eject or release a substance, such as a polymer, or have specially textured surfaces that could improve the character of the flow of water inside the boundary layer. The use of anti-fouling for retarding underwater organic growth is permitted. Only one spinnaker pole shall be carried on board. The method of storing the spinnaker pole is unrestricted. Exceptions to this rule are: A carbon fibre tube may be used. The inside diameter of any replacement tube must be the same as the original aluminum tube. The use of any electronic navigation equipment is unrestricted. Any number and type of masthead wind indicators may be used and any number and type of ribbons, wool or similar wind indicators may be attached to the sails or rigging. a) Additional lockers, bookshelves, stowage or other personalised accommodation equipment is permitted provided that it is constructed in such a way that it does not alter the design characteristics of the trim or hull strength. b) A support brace may be fitted to the the V-berth bulkheads. This support brace shall be installed no higher than the highest horizontal edge of the existing bulkheads. No modifications to the hull or liner are permitted. Attachment of brace shall be with stainless or brass fasteners. Fasteners shall be attached only to the brace, V-berth bulkheads and mast support tube. There is no limit to the amount of personal safety equipment that may be carried. Repairs and preventative maintenance to the sails, hull, keel, rudder, saildrive, deck, spars, standing rigging, running rigging, fittings and equipment may be carried out without violation of these Rules provided such repairs are made in such a way that the essential shape and profile or characteristics are not materially affected. In the event of the failure of any fitting, or the replacement of fittings as authorized by these Rules, the same or a replacement thereof of the same size (where required) and function shall be replaced in as near as possible the same position. a) The Class Rules may be amended by The Council provided that at least two thirds of the votes received within 30 days from the delivery of a ballot to each voting member are in favour. The two thirds majority must represent at least 40% of the total number of voting members. ii) By direction of a Voting Member where a proposal has been signed by at least 6 Voting Members.